Quick Study: Vladimir Makanin is a modern classic whose diverse literature draws on fantasy and existential themes as well as the Russian canon. The Makanin File: Vladimir Makanin, a former math teacher with a love of chess, published his first novel, Straight Line, in 1965, and has published collections and novels regularly ever since. 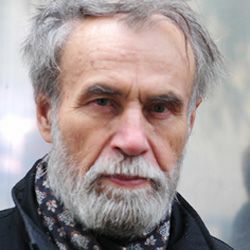 Makanin’s stories and novels often incorporate futuristic and mystical elements, and some of his more recent books, such as Asan, which won the 2008 Big Book Award, and Underground, a 1999 Russian Booker finalist, overtly draw on Russian classics as they examine, respectively, the Chechen War era and individuals left out of society during Russia’s social changes. Makanin won the 1993 Russian Booker for Baize-Covered Table with Decanter. Psssst………: If you want to challenge Makanin to a chess match, please know that he sees play with the white figures as “light and graceful, not always deep. But the black figures are the complete opposite: one can’t think about victory here. You have to become one with your position and force your opponent to lose.” In another interview, Makanin used chess pieces as a metaphor for writing, saying that white is for topics he knows fairly well and black is for little-known topics that he likens to a “dark forest” that requires him to “slowly get in touch with the topic” and avoid quick decisions. Makanin’s Places: Born in Orsk. Studied math at Moscow State University and filmmaking at a Moscow film school; he lives in Moscow. On Writing: Makanin says his characters aren’t autobiographical and that they don’t have definite real-life prototypes, though he takes bits from his own life and from his neighbors. “Surrealism in a Proletarian District” was published in 50 Writers: An Anthology of 20th Century Russian Short Stories (Academic Studies Press, 2011, story tr. Valentina Brougher, Frank Miller, Mark Lipovetsky).